Originally released in 2002, Macanudo’s Gold Label was launched as a limited edition from the brand’s Café range. By popular demand, the Gold Label quickly went on to become a special annual event where only a limited number are produced ever year. Some months ago, BU Founder Paul Anthony gave me a sampler pack of the Gold Label as a gift. When I tried one a few days back, I was seduced by its smooth flavours and quickly reached for my pen to take some notes. You can use the links above to jump ahead or scroll down to read the review in its entirety. 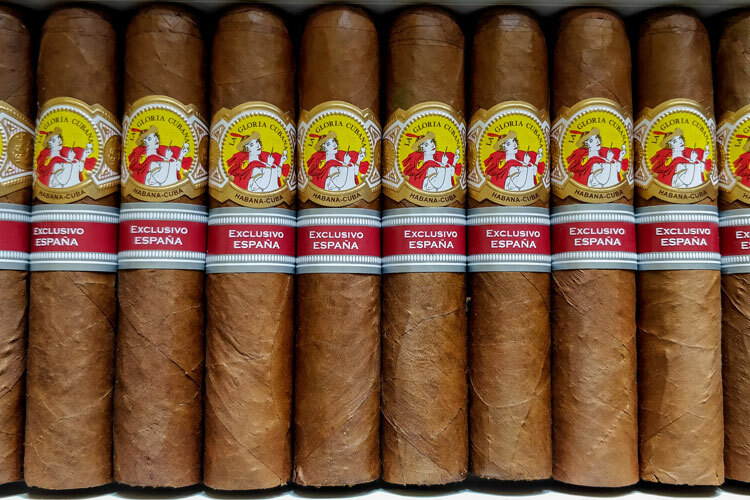 A major contributing factor to the Gold Label’s limited production is the “capa especial” or Special Wrapper. This is harvested from only selected 1st and 2nd Volado leaf primings of US Connecticut Shade plants. As such, these very light and almost golden wrappers are thin and delicate, which should produce a very mild flavour and an overall excellent burn. Meanwhile, the filler is a combination of Dominican-grown Cuban seed as well as Mexican leaf. As for the binder, it only uses 1st and 2nd primings of San Andrean Mexican leaf. A number of various vitolas are available as listed above, which include cigarillos and Churchills alike as well as several types of Toro. 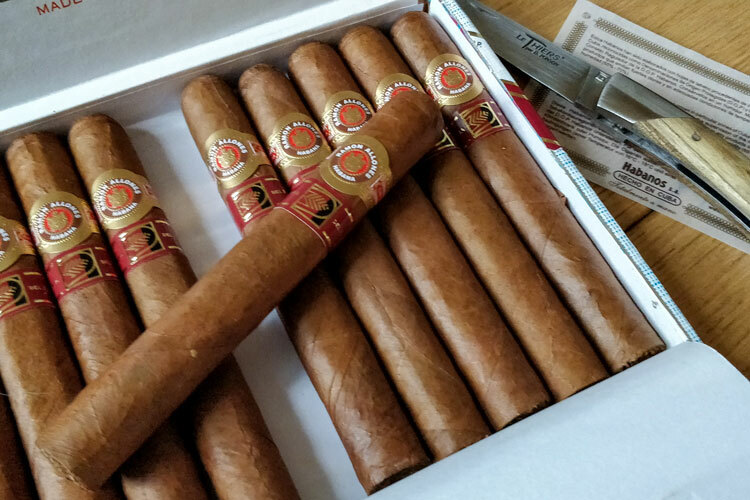 In this review, I smoked several Duke of York Robustos but you can likely expect a relatively coherent flavour across each format thanks to Macanudo’s famed quality and consistency. With a distinctively Connecticut Shade wrapper, the Gold Label has an almost fudge-like colour with a hint of gold and straw. Its hue is slightly deeper than the Nub Connecticut but it’s certainly in the same range. In terms of consistency and spring, the cigar has an overall even roll throughout the body, which gives a mild bounce when pressed. There’s mostly resistance save for a few mild soft spots. However, it’s nothing very concerning. Only but a few leaf veins were visible but they were quite appealing and blended in with the cigar’s body. It also gave a slight sheen against the light, which showed off the wrapper’s oils. As for the aromas, it’s remarkably unique. Expecting the usual Connecticut Shade odours of straw and barnyard, I was instead blown away by earthy vegetation and green notes. Whilst it was mostly reminiscent of earthy moss, it could also be likened to a roquette salad coated in Italian olive oil. Given that cigars are handmade products, we always smoke a few before giving them a full review. This ensures that our verdict is as accurate as possible by ruling out any anomalies and identifying the cigar’s consistencies. On the pre-light or “dry” draw, I found that the Gold Label only gave a very mild resistance. However, in terms of aromas, I was very surprised by what I experienced. It was remarkably sweet on the palate to such an extent that I wondered whether it had been flavoured. It turns out that this is the leaf’s natural aroma and it was accompanied by some very aromatic notes too. Overall, I picked out a little thyme, some barnyard straw as well as flavoursome brown sugar. The first plumes of smoke opened my sinuses with a refreshing burst of aromatic and zesty flavour. I grow some citrus thyme (thymus citriodorus) in my garden and it was certainly evocative of its flavour. However, as the first third settled, it became more reminiscent of herbaceous sage and smooth rosemary. On the retrohale, there was some smooth buttercream with a hint of lemon zest, which was very cool in the nostrils. By the second third, the Gold Label’s flavours had evolved into something altogether different. In fact, this sudden evolution in flavour is what had prompted me to start taking notes as I was utterly seduced by its complex character. The sweetness of the first third had almost entirely subsided but instead developed a salty note at the tip of the tongue. There was still an abundance of cream yet this was now complemented by an overt mossy note that was singularly reminiscent of seaweed. With the added metallic note of copper, there was also a mineral character that was almost like crisp sand that braced the teeth. Overall, the experience was deeply evocative of a hot day at the beach where the cream could be likened to sun lotion whilst the mineral and seaweed notes fulfilled their roles perfectly. On the retrohole, I experienced rounded notes of charred bay leaf accompanied by the soft and silky yet sharp texture of the smoke. Into the final third and the slightly metallic coppery notes had grown into something more overt whilst the mineral note lingered on the back of the palate. Meanwhile, the cream notes grew to become more mellow and mildly bitter like brandy butter. However, it was as I progressed half-way through the final third that the cigar that the complex crescendo of flavours whisked me away on another journey. I could only describe this experience as a veritable Madeleine de Proust. This French metaphor comes from Proust’s “Du côté de chez Swann” where the author describes how he experienced a childhood memory when tasting a traditional sponge cake. As the aromatic notes had mellowed, they evoked a simmering ratatouille. Meanwhile, the copper notes had the charred taste of the metal casserole that my grandmother used for cooking over the fire. Unexpectedly graphic as this experience was, I was taken back to my childhood holidays in the south of France. It didn’t end there and the nub’s retrohale would sting my nostrils in the same way as swallowed seawater when swimming in the Mediterranean sea. Once drawing towards the nub, the cigar’s flavour grew into an amalgam of the notes and accords experienced throughout the second and final thirds. There were overt notes of deep blue seawater and seaweed as well as sun cream and sand. Nevertheless, the aromatics were still present and ensured that the smoke was still refreshing rather than peppery even as I burned my fingertips. Being well-rolled, the ash proved to show excellent an excellent backbone despite being a Robusto vitola. Although the burn angle was quite wavy, there was only a narrow strip of charring. However, the burn straightened out nicely once into the second third. As for the ash itself, it had a beautiful steely colour with the odd dark stain. The smoke was surprisingly cool too and I experienced a very light resistance when taking in a draw. This remained consistent throughout the smoke and the cigar didn’t expand nor did it contract as I made my way through each third. Finally, the overall smoking time come to around 70 minutes when smoking at a normal rate. Careful smoking could likely bump this up to just under two hours whilst the more zealous among us would probably finish it in around 45 minutes. 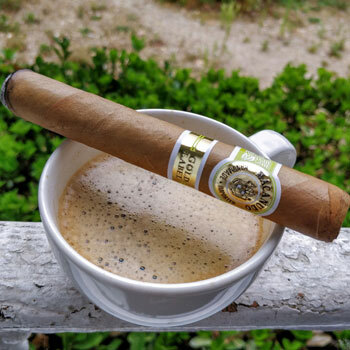 Following my deeply personal experience in smoking the Gold Label, it’s likely a cigar that I’d smoke alone in order to enjoy its complex flavours. Nevertheless, it shouldn’t be accompanied with anything too strong given that it’s also mild. After all, you don’t want to numb your palate from its complexities. However, I did also try it with a smooth and mild Italian espresso and the two paired very well. The espresso helped extend some of the bay leaf notes experienced in the second third as well as the copper flavours. Otherwise, some light refreshments such as a beer or cider could work provided that they aren’t too sweet. As for whiskies, I’d likely sample it with something that’s not too mature from the Highlands as they tend to have a much more balanced character. 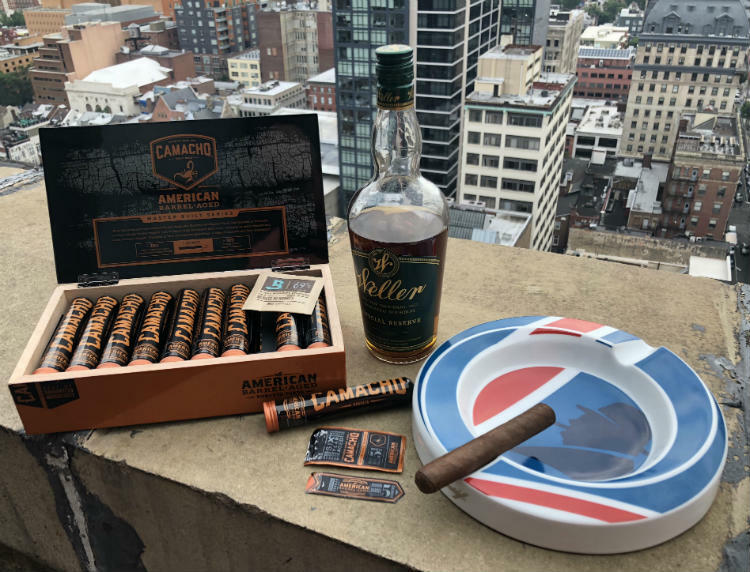 Given that this was a cigar that I received as a gift in a sampler pack, I was never able to get a close look at the box. Therefore, I can’t comment on this with much legitimacy. However, the cigar features two bands, which are very attractive. The main band is similar to those of the Macanudo Café range but with a lime green colour for the accents. Overall, its design is modern but with a a traditionally-influenced design. One end of the band features a text heralding the quality whilst the other shows a map of the Dominican Republic. Meanwhile, the second band presents “Gold Label” on a gold background with two parallel green strips. When it comes to removing the bands, the first one is much easier. Nevertheless, I’d recommend leaving it until the last minute as the cigar’s heat will help weaken the glue. Otherwise, they can be a tricky. Finally, the value for money regarding this cigar can vary but tends to be very reasonable for what it offers. Prices tend to be around $9 to 11 USD according to availability. However, it’s this factor that is key given that they’re only released on an annual basis. Therefore, you might have some work in sourcing them but many online retailers tend to have a decent stock. When Should You Smoke A Macanudo Gold Label? As a regular cigar smoker, I found this to be particularly pleasant around the mid to late morning. However, it’s also a great choice following lunch during digestion. Given my own albeit very personal experience with this cigar, I would recommend it especially after a light meal that consists of olive oil based meals such as salads or even a traditional ratatouille. Otherwise, this is a very high-quality cigar from a renowned manufacturer. Therefore, it’s something that can either be smoked alone or with friends as well as more formal and prestigious events. Finally, this is an excellent cigar for a beginner and I’d recommend it as a first smoke alongside either a Nub Connecticut or Cuban Quai d’Orsay. Its complexities will ensure that newcomers will discover something with their first smoke whilst its mildness prevents the experience from being overwhelming. As much as I enjoy cigars, it’s rare for one to have such a deeply profound impact on me. The Macanudo Gold Label is an exceptional cigar and will provides both veteran and newbie smokers with a unique experience. Thanks to its mild body, it’s a universal cigar that just about anyone can try. Whilst beginners may not pick out all the nuances straight away, they will surely identify something and it may kick-start their journey to exploring the cigar world. However, experienced cigar smokers will enjoy its unique and complex crescendo of harmonious flavours. Perhaps it would have such a personal affect on them as it did with me, but I’m confident that they will experience something new. Reviewed by Charles-Philippe, on 23rd July . "A mild yet intricately complex cigar. Never has a cigar given me such a deeply personal and evocative smoking experience." Wow that is a mad ash stack in your hand. I never seem to be able to get a long ask like that. Our man Charles-Philippe is monster when it comes to getting big stacks. If you’re having trouble it may be one of several reasons, from poorly stored cigars (for example under humidify cigars wont stack well) all the way to a shaky hand! Next time I see one, I shall buy and give it a try. Perfect, let us know how you like it?